Pastor Drew has been active in ministry since accepting Jesus Christ as Lord and Savior back in 1983.He grew up in Dayton, Ohio and obtained a B.A. from Westminster College in New Wilmington, PA. He served as Director of Campus Ministry at First Presbyterian Church in New Wilmington, PA until sensing a call to seminary. After graduating from Gordon-Conwell Theological Seminary in 1999, he was ordained and accepted the call to be Associate Pastor for Christian Education and Fellowship at First Presbyterian Church in Meadville, PA. 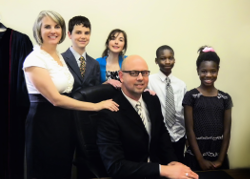 In 2003, the Ellings moved to Cedarville, OH where Pastor Drew served as the Head of Staff for seven years. In 2010, he accepted a position as Associate Pastor for Missions and Evangelism at First Presbyterian in Peachtree City before joining FPC Griffin in 2014. Pastor Drew has been married to Jennifer since 1992. They have four children: Emily, Jackson, Jimy and Eden.